Finding a suitable mountain, which I had not climbed and not too far away took some time, but eventually we agreed on Meall Buidhe. 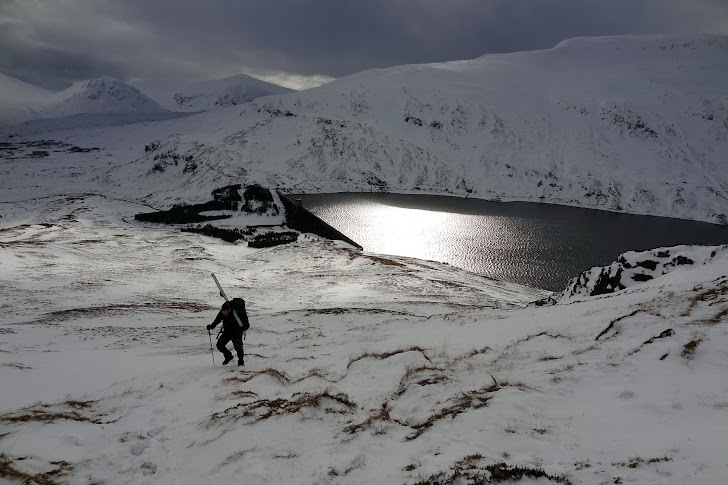 We set off from the car and by the time we had reached the car park and official starting point, Marco had realized that walking in Skis somehow got harder since his last outing 20 years ago and decided to carry the Skis to the top- a wise decision! I lead the way up the mountain and unfortunately the snow was deep and soft. It looked lovely, but it was hard going. Marco was struggling with the weight of his gear, but refused any help for the first 45minutes. When he finally accepted my offer to carry his Skies for while, I realized that carrying 6 kilo Skis, any length of time up a hill is a big pain in the backside!!! The only way to help in the long was to carry one Ski each. It will definitely not go down as something I have to do again, but using the Ski as an awkward walking pole (a very heavy one I might add) was the only way. We finally reached the top, after a much longer time than planned, but the views were spectacular. 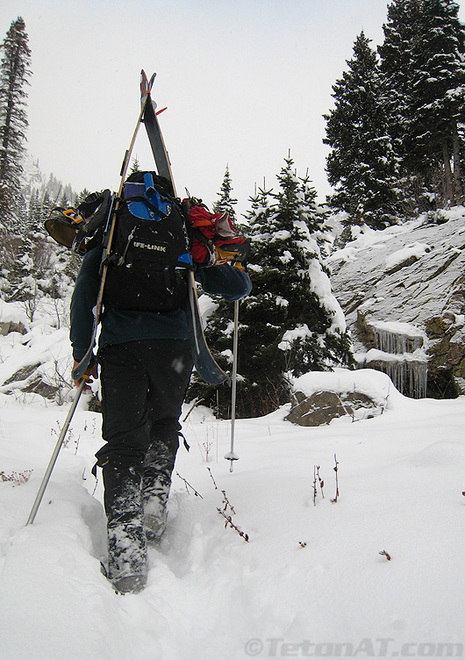 At least for the last bit we were able to dump the gear at the first cairn and make the way without the baggage. The non advisable walking pole! That one...we never saw it happening, but it must have went down while we were up there. While since I have into Glen Lyon area. Had to get my head around which Meall Buidhe it was...907 or 932...ok now! Just to say that that looks like a full depth Slab avalanche.....wonder what triggered that one off? Maybe the folks at the SAIS would like to know the exact location of the slide for their records. I think that they are contactable though their site. Good bit in the sunday mail seven day pull out on ski mountaineering. the mountain skis have a non slip skin for going up hill which is removed for flying off doon hill. Probably best if you can Ski before trying tho just in case you need to stop . That last shot of the loch (with added avalanche) is a beaut. Lovely pics. Kudos on carrying up the skis! I once hiked from the car park up to the top of the white lady cos all the lifts were shut due to high winds. Swore never to carry skis up a mountain again after that! Was ok on the way down tho. Great photos, and a bit of a cumbersome approach to skiing . Looked like it was well worth the effort for the descent though (for Marco at least ). Yes I agree and Avalanches are something I prefer to see from far away! Saying that I yet have to see one coming down. I have to say I was a bit jealous, but my skiing skills are defo not up for this. I will still have to add it to the website - thanks for bringing it to my attention! I think I have to give the skinning a go myself. Benjaminnevis wrote: Good bit in the sunday mail seven day pull out on ski mountaineering. the mountain skis have a non slip skin for going up hill which is removed for flying off doon hill. Probably best if you can Ski before trying tho just in case you need to stop . Lol I think if I would try it any walker would have no problem overtaking me. Going downhill fast just scares me. Many thanks The whole gear was 11.5 kilos. One ski is about 3 kilos...not too bad, but rather awkward to carry due to the width of it. Shug wrote: Lovely pics. Kudos on carrying up the skis! malky_c wrote: Great photos, and a bit of a cumbersome approach to skiing . Looked like it was well worth the effort for the descent though (for Marco at least ). I'm somewhat mystified that your friend has ski touring gear but (a) can't skin uphill and (b) doesn't know how to carry a pair of skis on a rucksack! jmarkb wrote: I'm somewhat mystified that your friend has ski touring gear but (a) can't skin uphill and (b) doesn't know how to carry a pair of skis on a rucksack! Good on him for having a go! Nice one ML...some good iamges in there..Think I would need to be Hawf Piste to try carrying skis up a big hill, so well done for helping Marco out there..think he got a good deal on the day with the ski down.